Given all the web work I have been doing in the recent past, it feels good every once in a while to create something that gets printed. 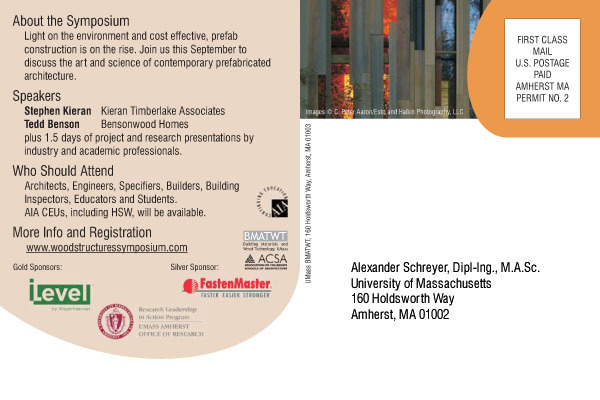 So here’s my latest project – an announcement postcard for the 2008 Wood Structures Symposium to be held at UMass in Amherst, MA. Above is the front and below is the back of the card. 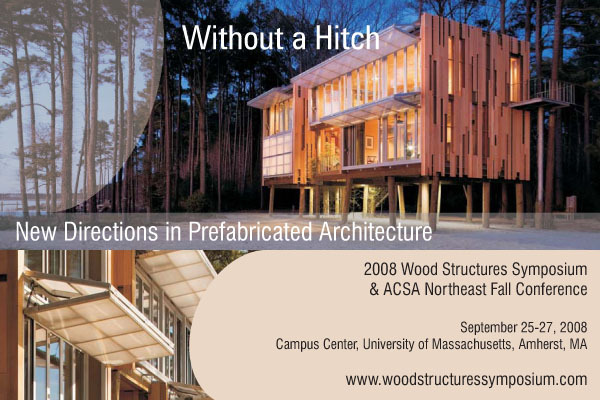 The idea behind the design is to promote new directions in prefabricated construction while keeping history in mind. These two tendencies are illustrated on one hand by the stunning visuals of the Loblolly House by Kieran Timberlake Architects (Stephen Kieran will be keynote at the event) and the shape of the Airstream Trailer as a visual motif. In terms of font, I went with a condensed Helvetica (the Corel version, actually) to match the verticality of the wood siding. It also allowed to squeeze a lot of information on a little postcard. By the way – if you find the bottom of the back side a bit bare, then you’re right, it was a compromise to allow for an unflattering barcode to be printed in that space. My New Photoblog is Up!